Soothe your irritability and heal yourself emotionally. 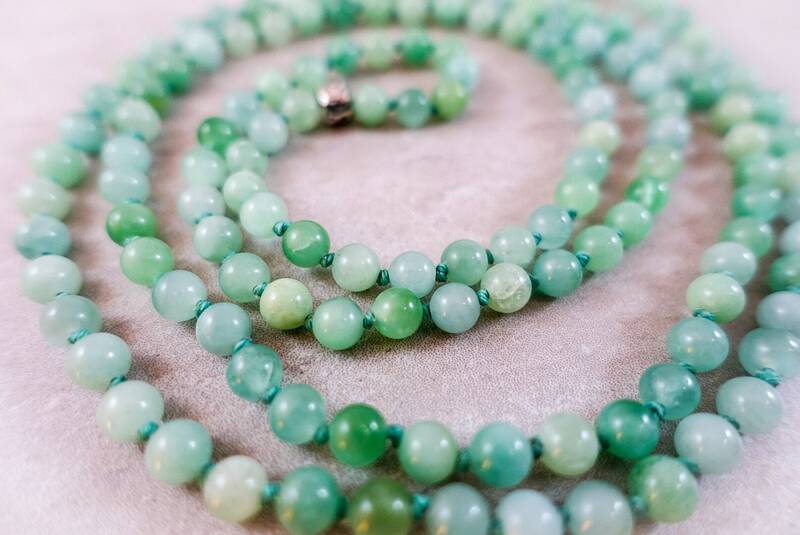 The calming, cool essence of Jade will inspire you to simplify your life and banish your insecurities. 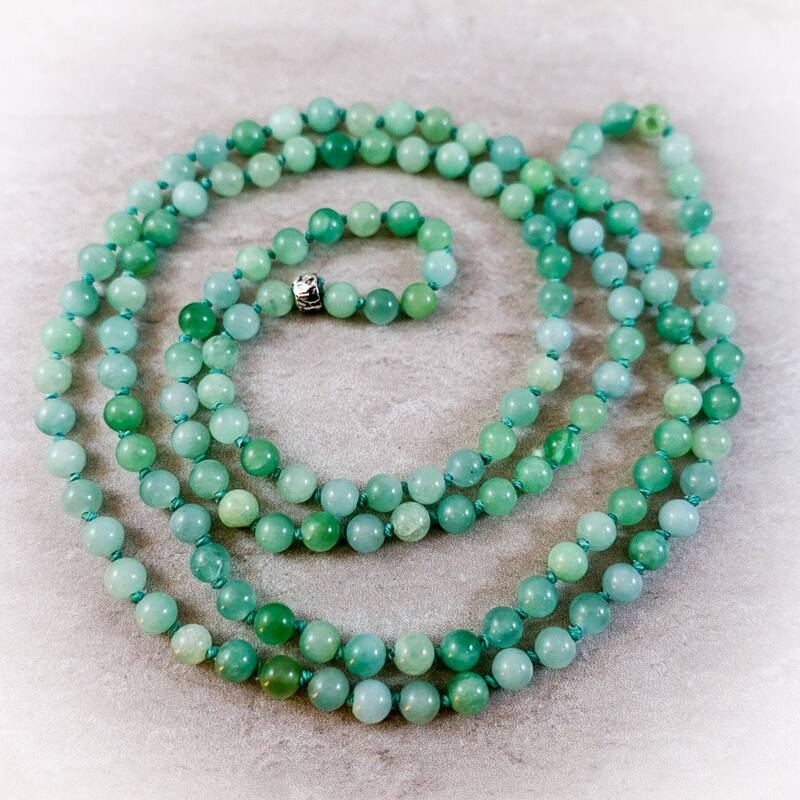 Minty-green beads are separated by sage-colored Irish linen. 36 inches, $152. “The Milestone Series.” The journey of life can feel taxing and overwhelming. There are ups and downs, bumps in the road, and deviations from our original plans. But life is full of momentous and exceptional moments that should bring us intense pride and gratitude for what we have done and are able to do. Each knot in the necklace symbolizes a milestone in a person’s life, a rite of passage to succeed and be fulfilled. While some milestones can feel negative and trying, in the end they craft and mold who you are as a person. Cherish your achievements, let go of the anxieties you feel towards life’s negative moments, and embrace the balance of the good and the bad. As circular as the necklace, life’s cyclical journey is oriented by respecting the past, living in the present, and looking to the future. 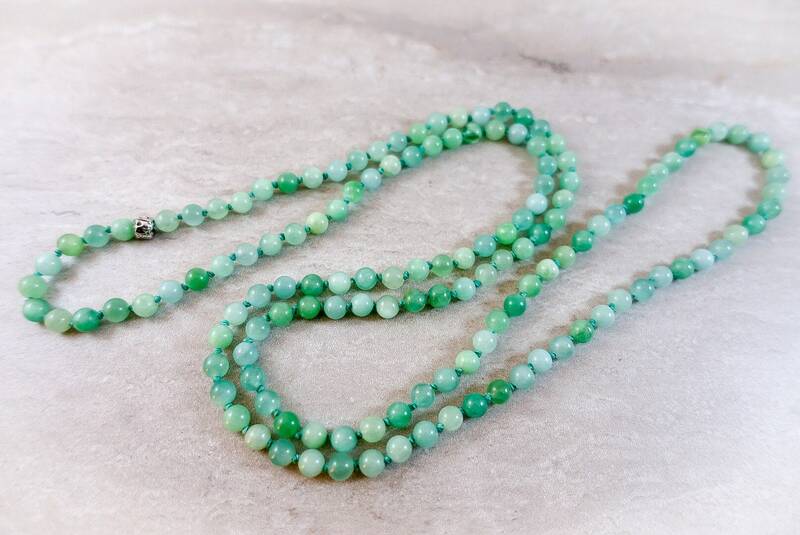 Ideal for layering, this necklace can be easily put on and taken off, and it’s infinity-style requires no clasp. Paypal is accepted. Credit cards are also accepted through Paypal. We ship to anywhere in United States. Shipping to Canada is available at cost. All in stock orders are shipped 1-5 days after payment is cleared excluding Sundays and holidays. I am happy to make custom orders, but they do take a bit longer, please contact me if you are interested in a custom order. If you would like to add shipping insurance, or would like your items shipped more quickly, please contact me and I will adjust the shipping price accordingly. Shipping fees cannot be reimbursed. I can not accept responsibility for parcels lost in transit. Insurance is available for an extra fee upon request and is recommended. Please contact me immediately if an item has been damaged during shipping as it is very important that you receive what you order. Damaged items can be refunded or replaced. Please note a 3% restocking fee will be applied. - Store jewelry in separate spaces to eliminate scratching and damage to stones. - Temperature should be kept constant to prevent cracking. - Keep out of sunlight to avoid fading or discoloration. - Do not wear around chemicals, during activities such as cleaning, swimming or showering. Gemstones can be porous and may absorb chemicals, even soap, which can build up inside the stone leaving the jewelry looking dull. - Additionally, be aware that the chemicals in cosmetics, hairspray, and/or perfume can damage gems. - The ultimate rule: when in doubt, leave it out. Think twice before putting gems in an ultrasonic cleaner or any chemical solution. Gems should be gently wiped clean with a moist cloth. A silver polishing cloth can be used to brighten the metal. Feel free to contact Moonstruck Design with any questions regarding care of precious gems.